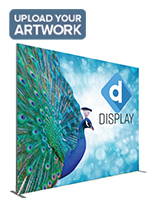 High resolution 720dpi graphics at the lowest price found anywhere! Collapsible design that sets up within minutes! Wheeled case for easy travel! 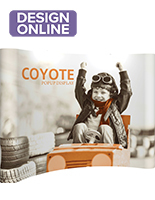 High-quality knitted polyester fabric banner stretches for wrinkle-free display! 3 Lights to highlight your graphics at no additional cost! 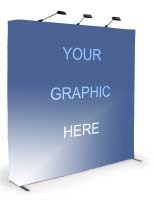 This trade show booth, also called a pop up display, includes a full-color 105-1/2"w x 89"h banner for marketing advertisements. The graphic wraps around the curved frame and straight end caps in a continuous image, and affixes to the frame with pre-installed hook and loop strips. 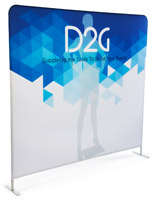 Made from high quality knitted polyester, this fabric booth banner is durable, flame retardant and slightly stretchy. 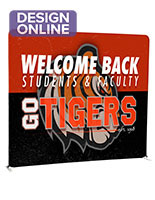 The stretch in the fabric allows your banner to be pulled tight when the frame is fully assembled to reduce wrinkles and give you the best look possible. 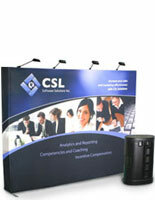 We also sell this trade show booth with 3 floodlights to illuminate your graphics. 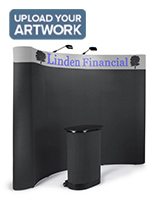 Designed with convenience in mind, this trade show booth is sold with a wheeled carrying case that makes traveling from show to show a breeze. Each case is made of heavy-duty, molded plastic and includes roller wheels, dual handles, and safety locks. 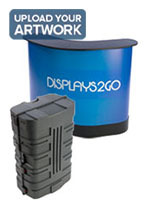 To prevent damage to your display, this carrying case will hold all of the pieces safely inside during travel. Each item within the travel case includes a padded bag for damage-free transport! There is also an additional storage compartment inside the lid of the travel case as well! 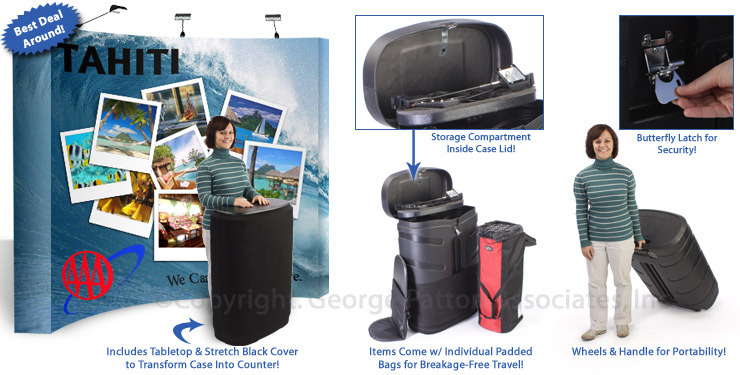 While we include this high-quality travel case at no extra cost, the downside is that your graphics must be removed from the frame before the unit is folded. 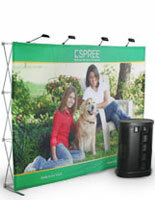 Your trade show booth will not fit in the case with the banner attached. There is room, however, for you to store your graphics inside. 105.5" x 89.0" x 17.0"
Very happy with our backdrop. It turned out great and should work very well for our booth displays. We were very impressed with this pop up display. Very simple to put together and the material is very light weight and looks very professional. The case is very sturdy, although, we will be adding tape and a lock to it when we ship it across the US, but I think it should be fine.